By car from Rome, leave the A1 Autostrada at Orte, joining the E45 in the direction of Perugia. After 20km or so ignore the sign for Perugia and continue straight to Spoleto. From Spoleto you can either carry on along the main SS3 highway before taking a left to Bevagna or you can explore the back roads between Spoleto and the town. There is a railway station at Foligno, 8km to the west, with connections to Rome and Florence. Piazza Silvestri. Here can be found the Palace of the Consols (Palazzo dei Consoli) in Gothic style, and the churches of San Silvestro (with a beautiful 15th Century Crucifix) and San Michele Arcangelo. 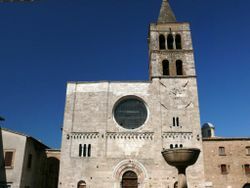 The two churches were built by the same architects in the 12th Century in Romanesque style. The layout of the square is not at all symmetrical, which adds to its appeal. The fountain, added in the 19th Century in fake Gothic style, offers potable water when sightseeing becomes thirsty work. Palazzo del Municipio (Palazzo Lepri) is on Corso Matteotti, which follows the route of the Roman Via Flaminia. The town hall dates back to the 1700s. There is a good, but small, museum. This page was last edited on 10 May 2017, at 13:57.